Every state has its own individual requirements and process for licensing barbers. To find out the requirements for the state of your choice and their individual application process you must go through, search online for the cosmetology board in the state where you live. 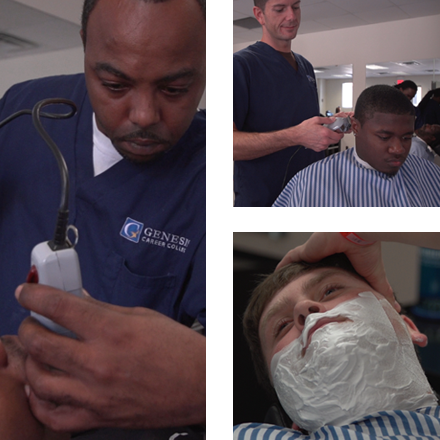 Genesis Career College offers a board-certified Master Barber program at the Nashville campus, and many of our graduates seek work as barbers in Tennessee. Barbers in Tennessee are regulated by the Tennessee Board of Barber Examiners, which refers to barbers as “master barbers.” The board requires that candidates seeking a master barber license pass two certification exams that are both administered by PSI Services, the state’s testing provider. Many state governments use PSI as a barber licensing testing service. Candidates would go to the Board of Barber Examiners homepage and print out this Master Barber Application to Test, which explains in detail the steps you need to take. Read it carefully, because it includes the registration form and instructions on how to get your application processed as quickly as possible. You begin the actual process by mailing your license application to PSI Services. Once approved by PSI, you will receive a postcard with instructions for paying for and scheduling your first exam – the written “theory and law” test. The fee for the “theory and law” exam is $70, and can be taken at several Tennessee test-taking locations: Chattanooga, Jackson, Johnson City, Knoxville, Memphis and Nashville. Only after you pass the written exam are you allowed to register for the hands-on “practical” exam, which also costs $70 and can be taken at locations in Memphis, Nashville and Knoxville. When you pass both examinations through PSI, congratulations! You will receive a notification along with a license application form to complete. Submit the application with the $75 license fee to receive your master barber license from the Tennessee Board of Barber Examiners. It can take four weeks to process. Questions? Need assistance? Contact the Tennessee Board of Barber Examiners at 1-800-480-9285 or PSI Services at 1-800-733-9267. The process you will go through in other states to become a licensed barber will be similar, though certainly not exact. Every state publishes a bulletin or some type of document that explains the process step by step. Once you find it online, print it out and read it carefully and you’re well on your way—or call for help. In our experience, licensing boards are responsive and helpful, answering phone calls in real time or returning emails the same day or the next day.